You know the old saying: “Give people roasted chicken, they’ll eat for a day. 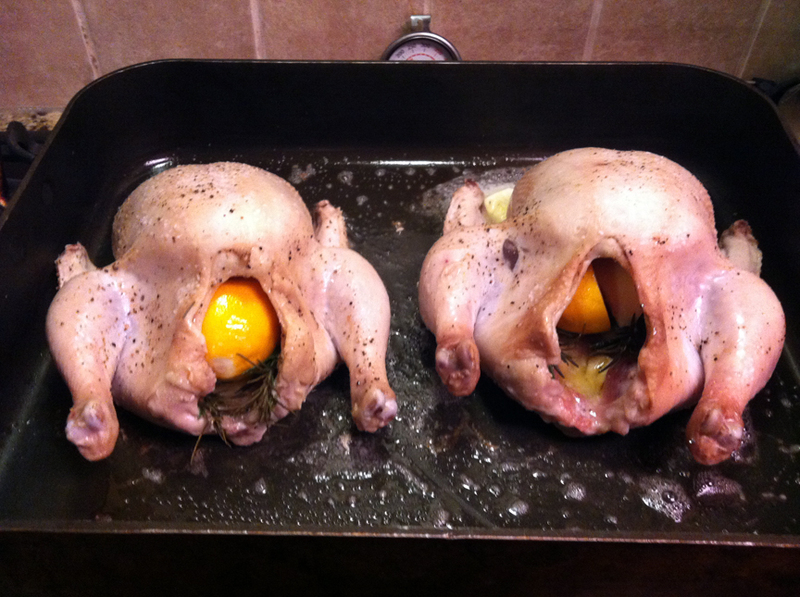 Teach them how to roast a chicken, they’ll eat forever.” What? That’s not how it goes? Well, it does now. 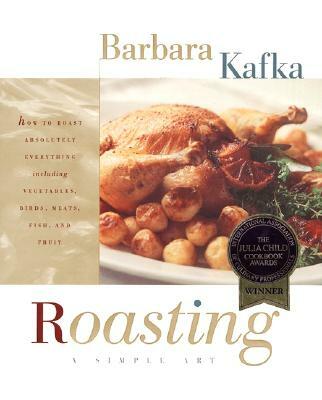 Barbara Kafka is the person who taught me how to roast a chicken, although she wasn’t aware of that when I called her this morning, at her home in Manhattan, to ask for permission to publish two of her recipes on The Midlife Second Wife. As far as I’m concerned her beautiful book, Roasting, A Simple Art, is the last word on that most fundamental kitchen skill. And her “continuous kitchen” philosophy is smart and economical, especially if you’re on a budget. 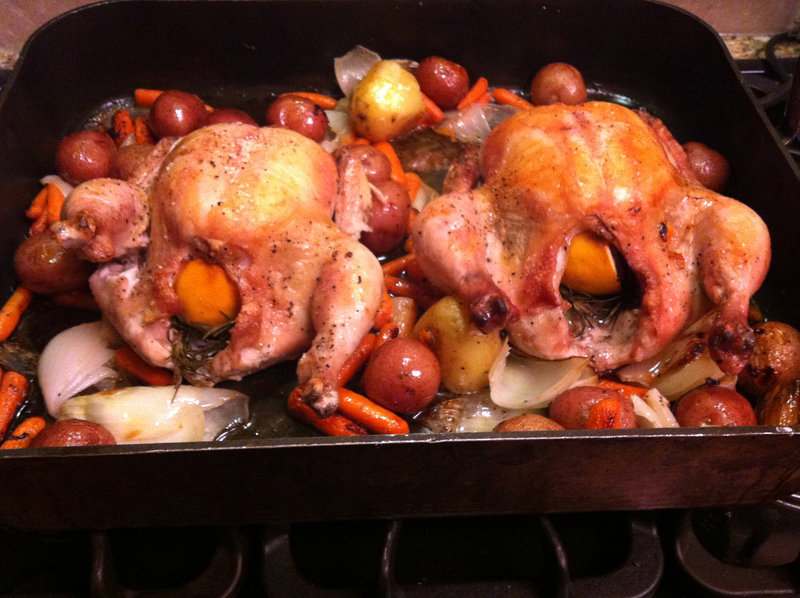 I’m always amazed by the number of meals I can eke out of one or two roast chickens. Kafka’s premise, that fish, fowl, meat—even vegetables and some fruits—are best roasted at extremely high oven temperatures (500-degrees Fahrenheit), has proved infallible in my kitchen. I have roasted chicken, standing rib roast, turkey, asparagus, cherry tomatoes, leeks, and more using this principle. The results are always wonderful: the high-heat method seals in flavor, yielding a crispy, succulent exterior and an interior that is moist and delicious. You’ll never serve a dry turkey again. Another Kafka principle to which I adhere is the “continuous kitchen.” Let’s use chicken as an example. I typically roast two at the same time. After we’ve dined on one, I reserve all of the bones and trim the carcass of all meat, which I reserve for leftovers (another roast chicken dinner, sandwiches, chicken salad, or a casserole). I do the same with the extra bird that has not been served. All of the bones, the wing tips (which I’ve removed before roasting), and the neck and giblets (saved before roasting) get tossed into my stockpot and filled with water. Do you see where I’m going with this? Homemade chicken stock—lots of it—to keep in your freezer. You’ll be able to read Kafka’s recipe for basic chicken stock in my next cooking post—or her book, if it’s not too late to add something to your holiday wish list. Copyright © 1995 by Barbara Kafka. All rights reserved. Used with permission. Today I’ll be sharing her famous recipe for roasted chicken. My thanks to Barbara Kafka for giving me permission to do so. Make sure that your oven is clean, as in spotless. If you don’t have time to clean your oven before trying this, don’t do it. Self-cleaning ovens are best (so much easier on the back), but I’ve successfully used the high-heat method in an ordinary oven. Make sure the rack is placed at the lowest section of your oven. I actually remove the top rack and rest my roasting pan on the bottom rack. Kafka might disagree with this; her instructions invariably say to place the rack in the center or bottom third of the oven. But when I’ve tried that I’ve found my food browned too quickly, so I’d lower the temperature slightly (or cover the top with foil) to avoid burning. (Every oven varies in temperature; mine have always seemed to be on the high end.) I’m also a worrier when it comes to high heat, and prefer the extra cushion of space at the top, especially if grease is popping energetically. Don’t leave the kitchen unattended while you’re doing this. That shouldn’t be an imposition; it’s a quick method, and you’re sure to have other related tasks to perform. Just stay nearby. Take care when opening your oven door to remove or check on what you’re roasting. Avert your head (especially if you wear glasses…trust me) and wait a few seconds before proceeding. Practice safe kitchen. Have a fire extinguisher nearby, and keep pets and children away from the oven area while you’re cooking. Place rack on second level from bottom of oven. (See my note above.) Heat oven to 500 o F.
Remove the fat from the tail and crop end of the chicken. Freeze the neck and giblets for Basic Chicken Stock. [Or refrigerate them in a sealed plastic bag if making stock the same day or the next.] Reserve chicken livers for another use. Sprinkle vegetables with salt and pepper and add to the roasting pan after the first 10 minutes of roasting. At 15-minute intervals, until the end of roasting time, stir the vegetables around with a wooden spoon so that they don’t stick to the pan. Remove the chicken to a platter by placing a large wooden spoon into the tail end and balancing the chicken with a kitchen spoon pressed against the crop end. 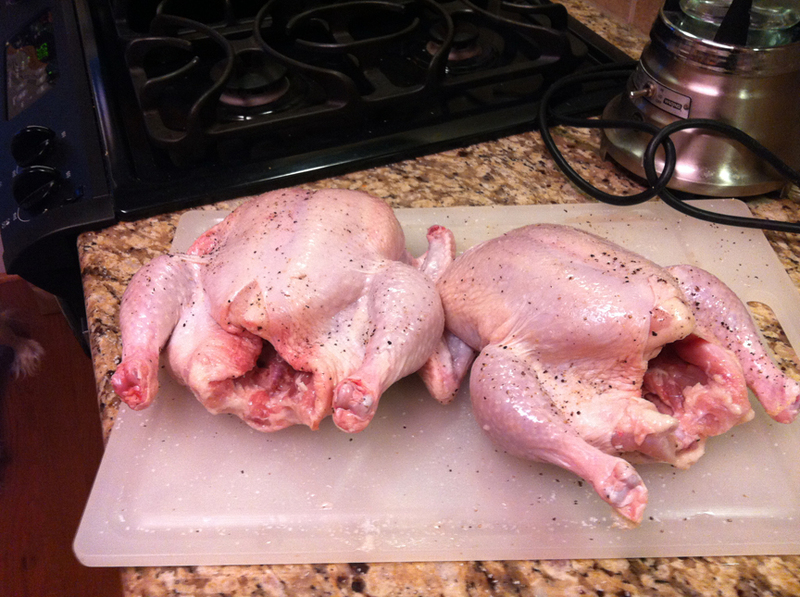 As you lift the chicken, tilt it over the roasting pan so that all the juices run out and into the pan. Pour off or spoon out excess fat from the roasting pan and put the roasting pan on top of the stove. Add the stock or other liquid and bring the contents of the pan to a boil, while scraping the bottom vigorously with a wooden spoon. Let reduce by half. Serve the sauce over the chicken, or, for crisp skin, in a sauceboat. 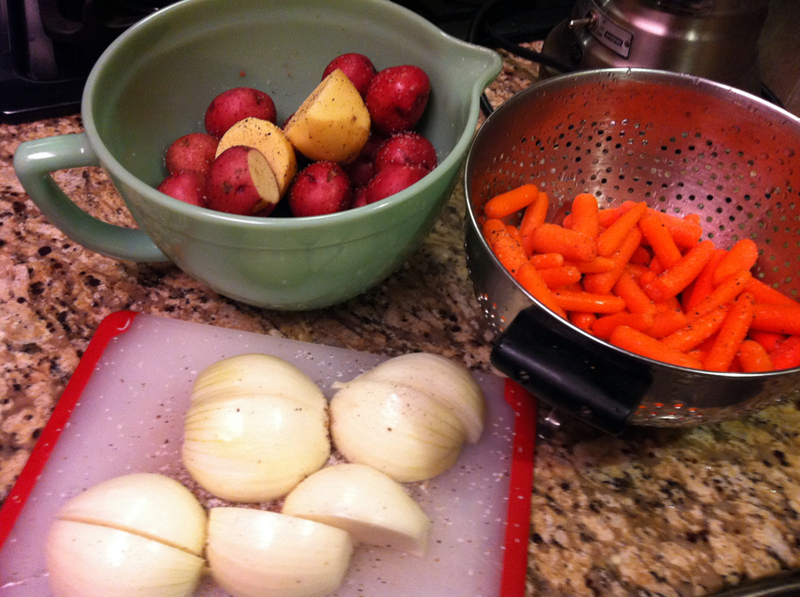 If you’ve added potatoes, onion, carrots, etc., remove them to a serving platter as well. Season with salt and pepper to taste, and then deglaze the pan. Next week, I’ll share Barbara Kafka’s method for making Basic Chicken Stock. And, for the holiday week, my food gift to you will be the Casserole Queens’ recipe for Chicken Pot Pie—just the thing to have on hand when company begins to fill your home! I’m not a fan of high-heat roasting, nor is my chef husband, except for some specific dishes. It leaves your oven a mess (even if you have a self-cleaning oven, it takes a LOT of energy to clean it). It doesn’t work at all well with organic birds, which we mostly eat – they don’t have much fat to begin with and high-heat roasting can really dry them out. I also simply prefer the longer melding of favors that slower roasting brings. But that doesn’t mean high-heat doesn’t work – it does. And a lot of chefs recommend it. What I’m wondering is what happens to whatever you’ve stuffed them with. Doesn’t high-heat roasting pretty much toast a standard bread stuffing? And how can you roast accompanying root veggies on high heat without killing them? Do you add stock? And then is that still roasting? I like the note to American cooks that the remains of a roast chicken can have many afterlives. Don’t think too many people make their own chicken stock, which is a shame – it’s so easy and so good. And unlike most grocery store stocks (even the organic kind), there’s no salt (never, never add salt to a stock!) and virtually no fat, just tons of chicken-y flavor. I should point out that I almost always prepare organic chicken and turkey. On the occasions when I’ve found the pan to be drier than I’d like, I merely add a dollop or two of butter. Problem solved. Nor do we always roast this way; John has prepared some wonderful pork and lamb roasts at moderate temperatures. As for a stuffed bird, I don’t. 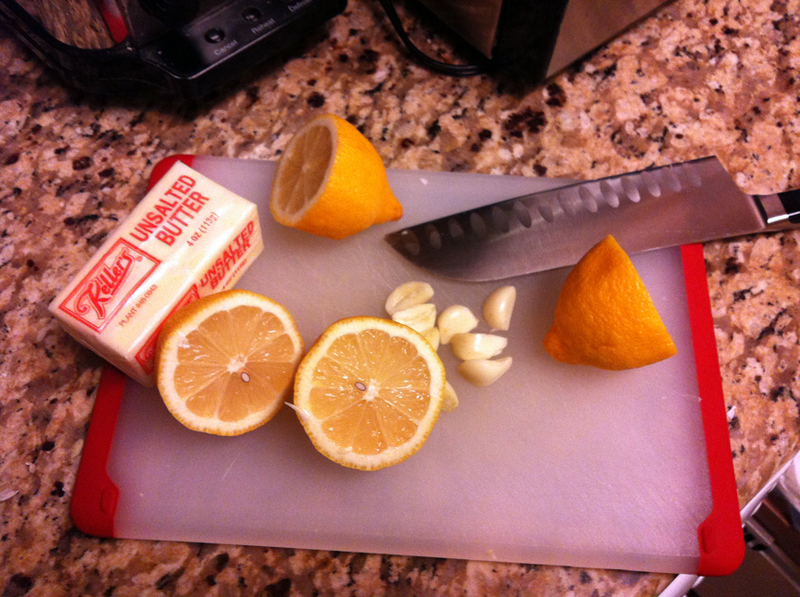 I haven’t stuffed a turkey since I began using this method of preparation. I make my bread stuffing the way I always have, but cook it in a casserole dish instead. If you look at the pictures, you’ll see I’ve roasted onions, potatoes, and carrots at 500-degrees. I haven’t killed them. They have an exceptional taste. I do not add stock, either. Adding liquid of any kind negates the roasting process; what you have then is braising, if you cover the pan. You’re spot on about homemade stock. There’s simply no substitute for the flavor, and it’s embarrassingly easy to make. As always, thanks for writing—and thanks for reading! p.s. Would you consider sharing one of your husband’s recipes on the blog sometime? If so, drop me a line and I’ll add it to my editorial calendar.